Oh, and it stores them in FIVE dimensions. Humans produce somewhere in the region of 2.5 Quintillion bytes of data per day (that's enough to fill 10 million blu-ray discs), and one of the major challenges we face is figuring out just what to do with it all. Researchers at the University of Southampton think they might have found a way and have proved, once again, that we're truly living in the sci-fi future we all imagined as young whippersnappers. 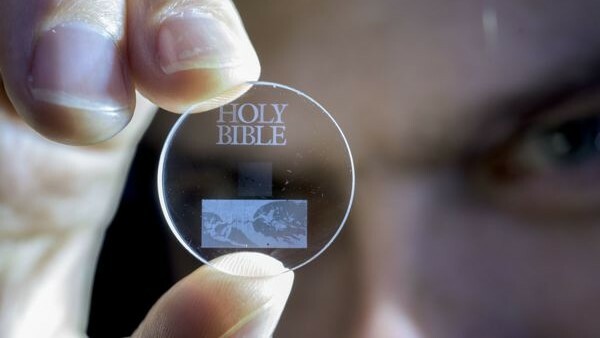 The five-dimensional (5D) digital data disk is capable of storing 360 terabytes (around 14,400 blu-ray discs). What's more, it will store it for 13.8 billion years which, by the way, is the age of the universe. To create the discs, a technique called "femtosecond laser writing" is used. This uses a high speed laser to write data in three layers of nanostructured dots just five micrometres apart. The five dimensional aspect comes from the three dimensional position of each dot, plus the size and orientation of said dot. The information stored on the disc can be read with a microscope and polariser. This "Superman memory crystal" (seriously, that's what they're calling it, sci-fi future), can be used to preserve information about our civilisation, from historical documents to the latest blockbusters. Not only does this save massive amounts of storage space, enabling us to store massive amounts of data in tiny devices, but also ensures that future generations will be able to look back at us with ease, and not rely on future archaeologists to dig up our plastic bags and fossilised iPhones. The team at Southampton has already saved classics such as the Universal Declaration of Human Rights, Newton's Opticks, The Magna Carta and The King James Bible. We're sure they'll get around to the Star Wars films next. The data is incredibly durable as the disk can withstand temperatures of 1,000°C and will still be readable in 13.8 billion years. For a bit of context, the Milky Way will collide with Andromeda galaxy in about 4 billion years and our sun is due to die in about 5 billion years. Looking backwards, 13.8 billion years in the past was around the time of the Big Bang. That's a long time to hold on to your recordings of True Detective. Hey, you. Yeah, you. You want some more science? Like us on Facebook or follow us on Twitter for your next fix.